Carbon fibers are processed to weave or braid into carbon fabrics, cloths and mats. Aramid fibers are manufactured in varying grades with varying qualities for strength and rigidity. They are tailored to specific design needs concerns. Glass fibers have reduced weight, improved surface quality and aerodynamics. They are easier to shape into complex shapes. There are two distinct categories of molding processes using FRP plastics viz. composite molding and wet molding. 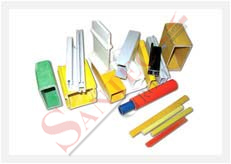 In composite molding, plastics are fiber reinforced before being put through molding process. Whereas in wet molding, it combines fiber reinforcement and the matrix or resist during the molding process. Ducting, scrubbers, fume cupboards, security cabins, air purifying chambers, etc. FRP doors, table tops, partitions, etc.